Chief Minister Prem Kumar Dhumal inaugurated two-day National Seminar on Hill Horticulture – Challenges and Opportunities, organised by Department of Horticulture in association with the NABARD here today. While addressing, Chief Minister said that State Government would set up a committee under the Chairmanship of Chief Secretary to explore the possibilities of setting up of fruit based industries in the State so that fruit growers get remunerative prices for their produce. 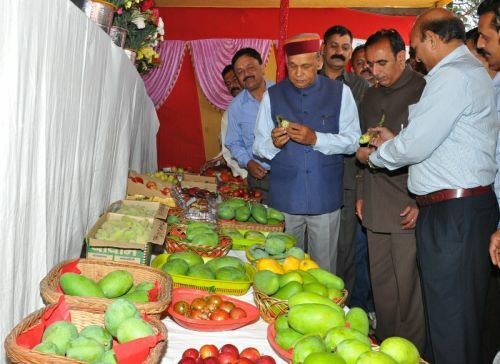 Chief Minister said that horticulture sector had been contributing significantly towards the State Gross Domestic Product and efforts were afoot to strengthen, diversify and modernize it so that people engaged in horticultural activities could find ample self employment avenues at their door steps in their traditional avocation. He said that instead of selling the fruit produce under MIS, growers would be selling the same for producing of value added products and fruit wastage would be checked. He said that growers were producing 38 species of fruit, apple, mango, peach, cherry etc. being the major crops of them. He said that with the setting up of the fruit based industries horticulture produce would get locally consumed. He said that efforts were afoot to import high yielding varieties of fruits plants to multiply fruit yield to match global standards. Prof. Dhumal laid stress upon organic farming in the state, especially in the tribal and high altitude difficult areas, where farmers were still continuing with the traditional farming practices with local farm inputs. He said that since the organic produce had ready market all over the country and could provide remunerative prices to the growers. He said that the State Government had decided to provide one retail outlet in all its marketing yards to sell organic produce produced locally besides one additional to sell fertililzer, seed, pesticides and fungicides farm inputs. etc. to the growers. He said that with a view to save growers from the exploitation at the hands of middlemen, the marketing network was being strengthened. He said that a modern Rs. 100 crore marketing yard was coming up at Parala, near Theog, and similar marketing yard to be constructed at Karluhi in district Una at equal cost had been proposed for the benefit of producers of lower areas. 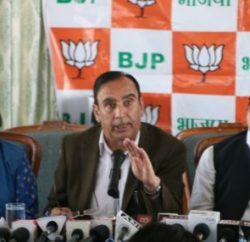 He said that it would help attract bet buyers from all over the country to visit Himachal Pradesh and purchase fruit and vegetables etc. saving growers of the marketing worries outside the State market terminals. 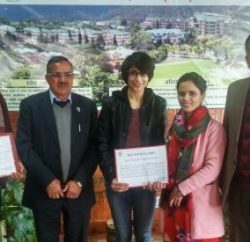 He said that Himachal Pradesh had the largest chunk of its population inhabiting rural areas having based their economic activities on farm and horticultural activities. Chief Minister said that the State Government had formulated a plan to connect all the fruit producing villages, which had not so far been connected with motorable roads or otherwise where road connectivity was not feasible, with ropeways so that their produce was carried to the main road head for onward transportation to the market terminals. He said that Anti Hail Gun experiment had been successful and would be replicated in other hail prone fruit growing areas in a phased manner. He said that Horticulture Technology Mission had been of immense help in giving boost to the fruit cultivation. He cautioned fruit growers to take all precautions and innovate such varieties of fruits which could withstand during the ongoing global challenge of climate change and global warming. He hoped that outcome of the two-day Seminar would be of immense help to the fruit growers in strengthening their horticulture economy. 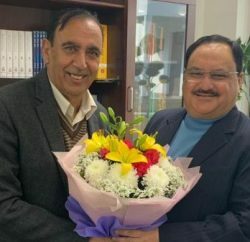 Narinder Bragta, Horticulture Minister, welcomed the Chief Minister and thanked him for according top priority to strengthening of horticulture sector and creating adequate network of marketing yards. He said that the State Government had posed Rs. 256 crore project to Government of India for funding to strengthening the anti-hail gun network to save fruit crops from hail storms for which 40 developmental blocks had been identified. He thanked Chief Minister for bringing apple and mango crops under the Weather Based Crop Insurance Cover which so far had covered 10 developmental blocks producing mango and 17 developmental blocks producing apple. He said that Rs. 12 crore worth of compensation package had been delivered to the fruit growers during preceding financial year. He said that high yielding varieties of apple were being imported to increase fruit yield per hectare to match global standards. He thanked Chief Minister for Rs. 85-cr Apple Re-plantation Scheme which was revolutionizing apple industry. He said that 40 additional marketing yards had so far been added to the marketing network besides Rs. 100 crore modern marketing yard construction work was in progress at Parala near Theog. V.C.Pharka, Principal Secretary Horticulture, welcomed the Chief Minister and said that crop diversification and modernization of horticulture sector was in progress with educating farmers through block level camps to diversify their traditional practices. He said that efforts were afoot to create cold chain network to store the produce besides creating network of packing, grading and allied facilities. Dr. Gurdev Singh, Director of Horticulture, proposed vote of thanks. Sher Singh Chauhan, Chairman, Rural Development Bank, Gyan Chandel, Chairman, APMC, Dr. K.R.Dhiman, Vice Chancellor, Dr. YS Parmar University of Horticulture and Forestry, Madan Chauhan, CEO, HPMC, Dr. J.C.Rana, Director of Agriculture, other senior officers of concerned departments and C.L.Negi, President, Fruit Growers Association were present on the occasion.